This is Esther and her big pink pocketbook. When it’s time to run errands, she flings it over her darling little shoulder and exclaims, “I’ve got my pocketbook! We can go now!” In it is she keeps her essentials. Today, there is a little book, a bracelet, some “lip-stuff” and a stuffed animal. Tomorrow, the contents most likely will change. She holds it carefully in her lap in her car seat. If she is given a treasure as we run around town, she has a perfect place to put it. Esther could have decided to carry a purse for her treasures all on her own. Many little girls do, and she does have four purse-carrying big sisters as well as a purse-carrying mommy. However, modeling for purse carrying came from another little girl – one with cartoon-like blond hair, beady black eyes and green pants. We’ve read of her adventures about town with her mommy so many times that it’s a shame this child speaks in first person and never shares her name with us. This is a picture of our nameless friend, who happens to carry a big green pocketbook – much like her mother’s blue one… and, Esther believes, much like her hand-me-down-from-big-sister pink one. Esther adores this story that we borrowed from a friend of mine. While I enjoyed reading it to her, I wouldn’t say it’s one of my all time favorites. It’s sweet, but it has only taught my daughter to carry around a pocketbook. Every time I see my cute three year old with her pocketbook of treasures, I am reminded of the powerful influence that stories can have in our children’s lives. If a little cartoon friend can convince Esther to carry a purse everywhere she goes, what else might she learn from stories? My hope is she’ll learn far more during our read-aloud times than the joy of pocketbook ownership. I once heard, “You are only changed by the people you know and the books you read.” God changes us most definitely, but there is no doubt that He often uses other people and words (spoken or written) to do so. I most certainly desire the truths of God’s Word to penetrate the hearts of my children. Yet there are so many good stories that testify of God’s faithfulness as well – missionary stories, biographies and fiction that direct little hearts toward the Lord. Might the Bible story of the little boy who shared his lunch inspire my children to be giving and trust Jesus? Might a missionary in Africa become their hero? Might my children be influenced toward gratitude after reading of Laura Ingall’s joy in receiving a penny and a piece of peppermint as her only gifts on Christmas Day? The answer to those questions is yes! I’ve seen the power of a book’s influence time and time again in the lives of my children. May I choose treasures to fill my daughter’s heart in the stories that I share with her. Just like she collects trinkets for her purse, may I collect and read edifying, wholesome books – books, full of life-giving, encouraging words and godly influence! 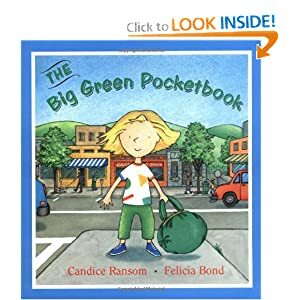 And while I’m at it, I may just pick up our own personal copy of The Big Green Pocketbook – just for fun! This entry was posted on Thursday, January 6th, 2011 at 4:13 am	and is filed under Children, Parenting. You can follow any responses to this entry through the RSS 2.0 feed. You can leave a response, or trackback from your own site. So well written!! Were you up at 4:13 AM? Actually, I was, Ma Boo! Christina got me up with an upset stomach and I couldn’t go back to sleep. So… I finished this little story that I began a couple of days ago.